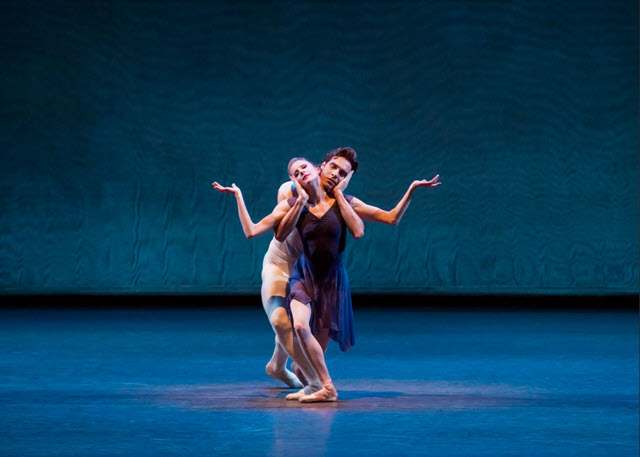 Opening night for the New York City Ballet offered a delectable selection of music and dance backed by the Kennedy Center Opera House Orchestra. 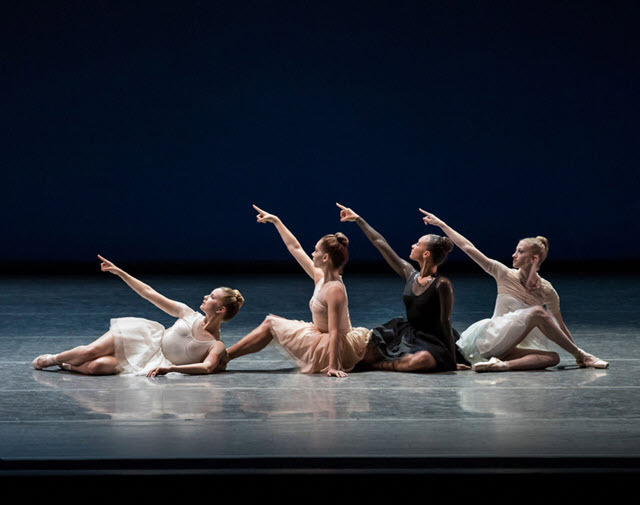 It was a thrill for the audience to see the dancers bring to life original choreography from George Balanchine, Jerome Robbins and Gianna Reisen to the music of Lukas Foss, Paul Hindemuth, Sergei Prokofiev and George Bizet. The program, which will be repeated on April 3rd and April 7th, highlights many of the troupes’ most notable dancers – Mary Thomas MacKinnon, Emma Von Enck, Kennard Henson and Roman perform in “Composer’s Holiday”, a Reisen design that heralds modernism. Abi Stafford, Teresa Reichlen, Joseph Gordon and Russell Janzen take the leads in “Kammermusik No. 2”, with Sterling Hyltin and Gonzalo Garcia taking leads in “Opus 19/The Dreamer. The final piece “Symphony in C” by Bizet is on four movements and showcases the talents of Ashley Boulder, Tyler Angle in the 1st an Allegro Vivo; Sara Mearns and Jared Angle in the 2nd an Adagio; Baily Jones and Anthony Huxley in the 3rd movement an Allegro Vivace; and Erica Pereira and Andrew Scordato in the 4th movement an Allegro Vivace which took us back to classical ballet with original Balanchine choreography performed with over 50 dancers. The costumes for this final piece were a contribution from SWAROVSKI and you could see the twinkling crystals adorning their tutus from the back row. Artistic Director of the NYCB, Jonathan Stafford reminded the audience that the NYCB has been performing at the Kennedy Center since 1974 and mentioned that Gianna Reisen wrote her first ballet last year when she was only 18 years old. Sterling Hyltin and Gonzalo Garcia in Jerome Robbins’ Opus 19/The Dreamer. Photo Credit Paul Kolnik. “Composer’s Holiday” uses precision and smooth movement to get its point across and there are a lot of heel-to-toe steps which seem like a country dance. But it is the elegant fluidity and angularity of the motions that elevate it. In “Kammermusik No. 2” we see many sections performed in delayed mirrored sequence as if the dancers are continuously unfolding. Sara Mearns in George Balanchine’s Symphony in C. Photo Credit Paul Kolnik. “Symphony in C” allows Tyler Angle to show off his magnificent form and gravity-defying leaps with Ashley Bouder. His brother, Jared Angle, follows in an equally memorable performance with Sara Mearns, my favorite dancer of the night. 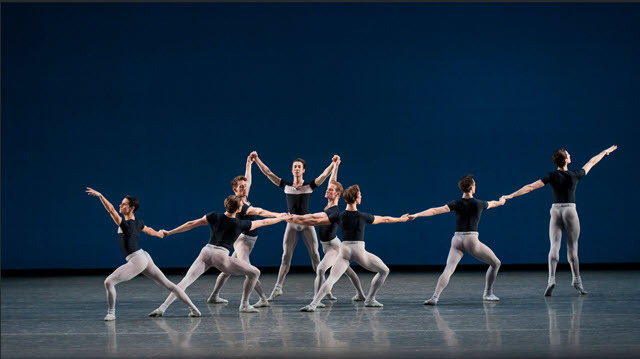 New York City Ballet in George Balanchine’s Symphony in C. Photo Credit Paul Kolnik. The following, “New Works and New Productions” are scheduled to be performed on the evenings of April 4th, 5th, and 6th with a matinee added on the 6th. Two Kennedy Center premieres, created for the centennial of Jerome Robbins, include Justin Peck’s “Easy” set to the music of Leonard Bernstein, and Tony Award-winning choreographer/director Warren Carlyle’s “Something to Dance About” featuring notable dance sequences from On the Town, West Side Story, and more. Also by Robbins, “In the Night” features three couples of distinct personality set to four of Chopin’s elegant nocturnes. Kyle Abraham’s “The Runaway”, another Kennedy Center premiere that fuses modern and classical technique with imaginative costumes by Giles Deacon, is set to an eclectic soundtrack that includes hip-hop giants Jay-Z, Kanye West, and others. In the Opera House at The John F. Kennedy Center for the Performing Arts, 2700 F St., NW, Washington, DC. For tickets and information call 202 467-4600.